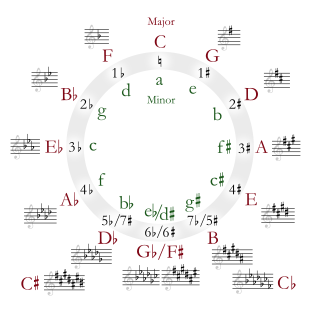 In music, the tonic is the first scale degree of a diatonic scale and the tonal center or final resolution tone that is commonly used in the final cadence in tonal classical music, popular music and traditional music. The triad formed on the tonic note, the tonic chord, is thus the most significant chord in these styles of music. More generally, the tonic is the pitch upon which all other pitches of a piece are hierarchically referenced. Scales are named after their tonics, thus the tonic of the scale of C is the note C.
In very much conventionally tonal music, harmonic analysis will reveal a broad prevalence of the primary harmonies: tonic, dominant, and subdominant, and especially the first two of these. In music, harmony considers the process by which the composition of individual sounds, or superpositions of sounds, is analysed by hearing. Usually, this means simultaneously occurring frequencies, pitches, or chords. In music, the dominant is the fifth scale degree of the diatonic scale, called "dominant" because it is next in importance to the tonic, and a dominant chord is any chord built upon that pitch, using the notes of the same diatonic scale. The dominant is sung as so in solfege. The dominant function has the role of creating instability that requires the tonic for resolution. 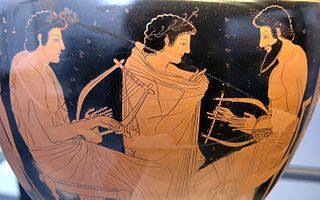 A melody, also tune, voice, or line, is a linear succession of musical tones that the listener perceives as a single entity. In its most literal sense, a melody is a combination of pitch and rhythm, while more figuratively, the term can include successions of other musical elements such as tonal color. It may be considered the foreground to the background accompaniment. A line or part need not be a foreground melody. Common-chord modulation (also known as diatonic-pivot-chord modulation) moves from the original key to the destination key (usually a closely related key) by way of a chord both keys share: "Most modulations are made smoother by using one or more chords that are common to both keys." For example, G major and D major have four chords in common: G major, B minor, D major and E minor. This can be easily determined by a chart similar to the one below, which compares triad qualities. The I chord in G major—a G major chord—is also the IV chord in D major, so I in G major and IV in D major are aligned on the chart. In music, a closely related key is one sharing many common tones with an original key, as opposed to a distantly related key. 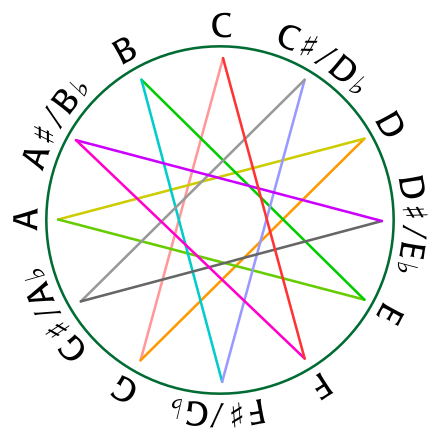 In music harmony, there are six of them: five share all, or all except one, pitches with a key with which it is being compared, and is adjacent to it on the circle of fifths and its relative major or minor, and one shares the same tonic. In music theory, a predominant chord is any chord which normally resolves to a dominant chord. Examples of predominant chords are the subdominant, supertonic, Neapolitan sixth and German sixth. Other examples are the secondary dominant (V/V) and secondary leading tone chord. Predominant chords may lead to secondary dominants. Predominant chords both expand away from the tonic and lead to the dominant, affirming the dominant's pull to the tonic. Thus they lack the stability of the tonic and the drive towards resolution of the dominant. The predominant harmonic function is part of the fundamental harmonic progression of many classical works. The submediant (vi) may be considered a predominant chord or a tonic substitute. An altered chord is a chord in which one or more notes from the diatonic scale is replaced with a neighboring pitch from the chromatic scale. According to the broadest definition any chord with a nondiatonic chord tone is an altered chord, while the simplest use of altered chords is the use of borrowed chords, chords borrowed from the parallel key, and the most common is the use of secondary dominants. As Alfred Blatter explains,"An altered chord occurs when one of the standard, functional chords is given another quality by the modification of one or more components of the chord." Chromaticism is a compositional technique interspersing the primary diatonic pitches and chords with other pitches of the chromatic scale. Chromaticism is in contrast or addition to tonality or diatonicism. Chromatic elements are considered "elaborations of or substitutions for diatonic scale members". An enharmonic modulation takes place when one treats a chord as if it were spelled enharmonically as a functional chord in the destination key, and then proceeds in the destination key. There are two main types of enharmonic modulations: dominant seventh/augmented sixth, and (fully) diminished seventh. Any dominant seventh or German sixth can be reinterpreted as the other by respelling the m7 or A6 chord tone (respectively) in order to modulate to a key a half-step away (descending or ascending); if the fifth from root chord tone of a German sixth is omitted, the result is an Italian sixth. A diminished seventh chord meanwhile, can be respelled in multiple other ways to form a diminished seventh chord in a key a minor third (m3 as root), tritone (d5 as root) or major sixth (d7 as root) away. Where the dominant seventh is found in all diatonic scales, the diminished seventh is found only in the harmonic scale naturally; an augmented sixth is itself an altered chord, relying on the raised fourth scale degree. In modern musical notation and tuning, an enharmonic equivalent is a note, interval, or key signature that is equivalent to some other note, interval, or key signature but "spelled", or named differently. Thus, the enharmonic spelling of a written note, interval, or chord is an alternative way to write that note, interval, or chord. For example, in twelve-tone equal temperament, the notes C♯ and D♭ are enharmonic notes. Namely, they are the same key on a keyboard, and thus they are identical in pitch, although they have different names and different roles in harmony and chord progressions. Arbitrary amounts of accidentals can produce further enharmonic equivalents, such as B, although these are much rarer and have less practical use. A seventh chord is a chord consisting of a triad plus a note forming an interval of a seventh above the chord's root. When not otherwise specified, a "seventh chord" usually means a dominant seventh chord: a major triad together with a minor seventh. However, a variety of sevenths may be added to a variety of triads, resulting in many different types of seventh chords. In music theory, an augmented sixth chord contains the interval of an augmented sixth, usually above its bass tone. This chord has its origins in the Renaissance, was further developed in the Baroque, and became a distinctive part of the musical style of the Classical and Romantic periods. Starting from a major chord, for example G major (G–B–D), there are twelve potential goals using a common-tone modulation: G minor, G♯ minor, B♭ major, B major, B minor, C major, C minor, D minor, D major, E♭ major, E major, E minor. Thus common-tone modulations are convenient for modulation by diatonic or chromatic third. "A passage in a given key ending in a cadence might be followed by the same passage transposed (up or down) to another key," this being known as sequential modulation. Although a sequence does not have to modulate, it is also possible to modulate by way of a sequence. A sequential modulation is also called rosalia. The sequential passage will begin in the home key, and may move either diatonically or chromatically. Harmonic function is generally disregarded in a sequence, or, at least, it is far less important than the sequential motion. For this reason, a sequence may end at a point that suggests a different tonality than the home key, and the composition may continue naturally in that key. A chord, in music, is any harmonic set of pitches consisting of three or more notes that are heard as if sounding simultaneously. A secondary chord is an analytical label for a specific harmonic device that is prevalent in the tonal idiom of Western music beginning in the common practice period, the use of diatonic functions for tonicization. In classical music from Western culture, an augmented fifth is an interval produced by widening a perfect fifth by a chromatic semitone. For instance, the interval from C to G is a perfect fifth, seven semitones wide, and both the intervals from C♭ to G, and from C to G♯ are augmented fifths, spanning eight semitones. Being augmented, it is considered a dissonant interval. In music, the mediant is the third scale degree of a diatonic scale, being the note halfway between the tonic and the dominant. It is sung as mi in solfege. Similarly, the submediant is halfway between the tonic and subdominant. The fifth note is almost always a perfect fifth, while the third note can equally be a minor or major third. In music, tonicization is the treatment of a pitch other than the overall tonic as a temporary tonic in a composition. In Western music that is tonal, the song or piece is heard by the listener as being in a certain key. A tonic chord has a dominant chord; in the key of C major, the tonic chord is C major and the dominant chord is G major or G dominant seventh. The dominant chord, especially if it is a dominant seventh, is heard by Western composers and listeners familiar with music as resolving to the tonic, due to the use of the leading note in the dominant chord. A tonicized chord is a chord other than the tonic chord to which a dominant or dominant seventh chord progresses. When a dominant chord or dominant seventh chord is used before a chord other than the tonic, this dominant or dominant seventh chord is called a secondary dominant. When a chord is tonicized, this makes this non-tonic chord sound temporarily like a tonic chord. In music theory, a Neapolitan chord is a major chord built on the lowered (flatted) second (supertonic) scale degree. In Schenkerian analysis, it is known as a Phrygian II, since in minor scales the chord is built on the notes of the corresponding Phrygian mode. The tritone substitution is one of the most common chord substitutions found in jazz and was the precursor to more complex substitution patterns like Coltrane changes. Tritone substitutions are sometimes used in improvisation—often to create tension during a solo. Though examples of the tritone substitution, known in the classical world as an augmented sixth chord, can be found extensively in classical music since the Renaissance period, they were not heard until much later in jazz by musicians such as Dizzy Gillespie and Charlie Parker in the 1940s, as well as Duke Ellington, Art Tatum, Coleman Hawkins, Roy Eldridge and Benny Goodman. A synthetic mode is a mode that cannot be derived from the diatonic scale by starting on a different note. 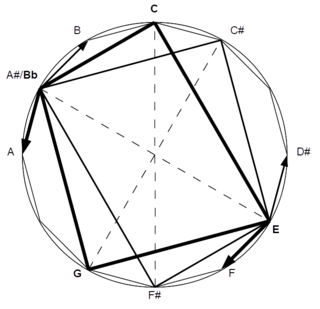 Whereas the seven modes are all derived from the same scale and therefore can coincide with each other, synthetic modes work differently. In music, an irregular resolution is resolution by a dominant seventh chord or diminished seventh chord to a chord other than the tonic. Regarding the dominant seventh, there are many irregular resolutions including to a chord with which it has tones in common or if the parts move only a whole or half step. Consecutive fifths and octaves, augmented intervals, and false relations should still be avoided. Voice leading may cause the seventh to ascend, to be prolonged into the next chord, or to be unresolved. In music, harmonization is the chordal accompaniment to a line or melody: "Using chords and melodies together, making harmony by stacking scale tones as triads". In music, the seventh factor of a chord is the note or pitch seven scale degrees above the root or tonal center. When the seventh is the bass note, or lowest note, of the expressed chord, the chord is in third inversion Play (help·info). ↑ Boston Academy of Music, Lowell Mason (1836). The Boston Academy's Collection of Church Music, pp. 16–18. Fourth edition. J. H. Wilkins and R. B. Carter. ↑ Forte, Allen (1979). Tonal Harmony in Concept & Practice, p. 265. ISBN 0-03-020756-8. 1 2 3 Forte (1979), p. 267. ↑ Benward and Saker (2009). Music in Theory and Practice, Vol. II, p. 214. ISBN 978-0-07-310188-0. ↑ Forte (1979), p. 307. ↑ Benward and Saker (2009), p. 244. ↑ Forte (1979), p. 305. ↑ Benward & Saker (2009), pp. 214–15. ↑ Benward & Saker (2009), p.220. ↑ "Enharmonic Reinterpretation" (PDF). Feezell, M. Retrieved 2016-04-05. ↑ Meyer, Leonard B. (1989). Style and Music: Theory, History, and Ideology, p. 299. ISBN 9780226521527. ↑ Kostka, Stefan and Payne, Dorothy (1995). Tonal Harmony, p. 321. McGraw-Hill. ISBN 0-07-035874-5. ↑ Briggs, Kendall Durelle (2014). The Language and Materials of Music, p. 198. Lulu.com. ISBN 9781257996148. ↑ Kopp, David (2006). Chromatic Transformations in Nineteenth-Century Music, p. 50. Cambridge University Press. ISBN 9780521028493. After Marx, Adolph Bernard. Theory and Practice (1837). Trans. Saroni. 1 2 3 Benward and Saker (2003). Music: In Theory and Practice, Vol. I, p. 245. Seventh Edition. ISBN 978-0-07-294262-0. ↑ Benward and Saker (2003), Vol. I, p. 244. ↑ Reti, Rudolph (1978). Tonality, Atonality, Pantonality. Westport, CT: Greenwood Press. ISBN 0-313-20478-0. 1 2 Forte (1979), p.319. ↑ Heussenstamm, George (2011). Hal Leonard Harmony & Theory – Part 2: Chromatic. ISBN 9781476841212. ↑ Jones, George T. (1994). HarperCollins College Outline Music Theory, p. 217. ISBN 0-06-467168-2. ↑ "Prelude to Musical Geometry", p. 364, Brian J. McCartin, The College Mathematics Journal, Vol. 29, No. 5 (Nov., 1998), pp. 354–70. (abstract) (JSTOR). ↑ Benward & Saker (2003). Music: In Theory and Practice, Vol. I, p. 243. 7th edition. McGraw-Hill. ISBN 978-0-07-294262-0. "Most modulations occur between closely related keys, which are those keys that differ by no more than one accidental in the key signature." ↑ Forte (1979), p. 269.